CHECK THE REVIEW OF THE SHOW IN THE TRIB. 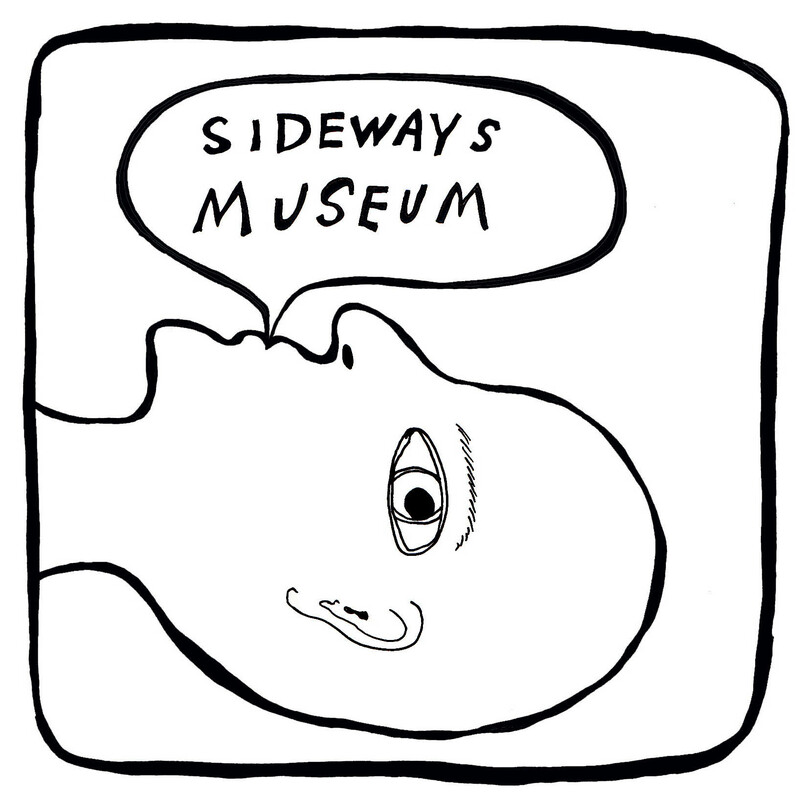 The Sideways Museum is on schedule to be unveiled on January 23, 2015. 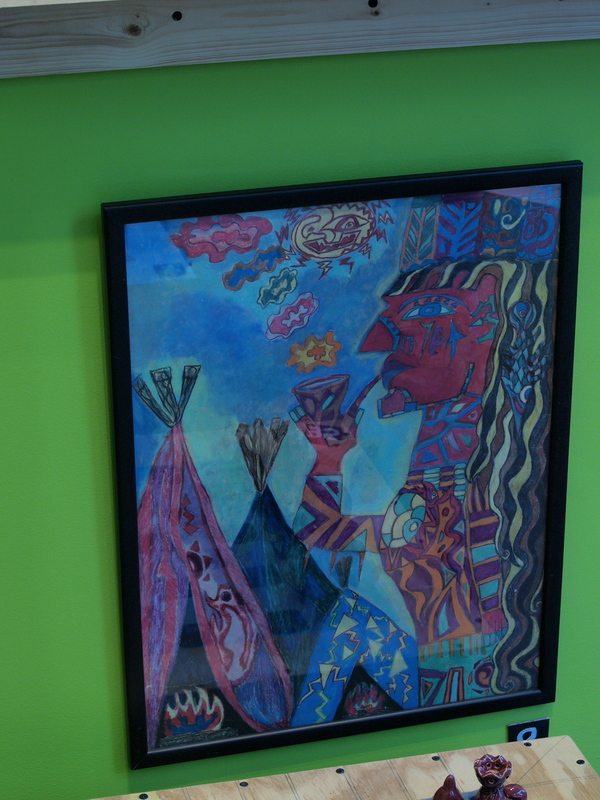 The Sideways Museum features a collection of works by Pittsburgh-based artists exploring folk and visionary art traditions. The project focuses on artists who often go unnoticed by art-world institutions. These artists have developed styles that are inspired by the Pittsburgh region as well as by daily life in the specific communities in which they live. Rather than reacting to trends in the art world, these artists pursue depth of meaning and invention, creating work on their own terms. WORKS ON VIEW. Numbers correspond to the numbered works in The Sideways Museum window display at SPACE GALLERY, 812 Liberty Avenue, Pittsburgh. 1. Doug Hill, Cardboard Wind-up Clock, cardboard, glue & string. This cardboard clock has an escapement and ratchet system, allowing one to wind it up for a run time of approximately ten seconds. 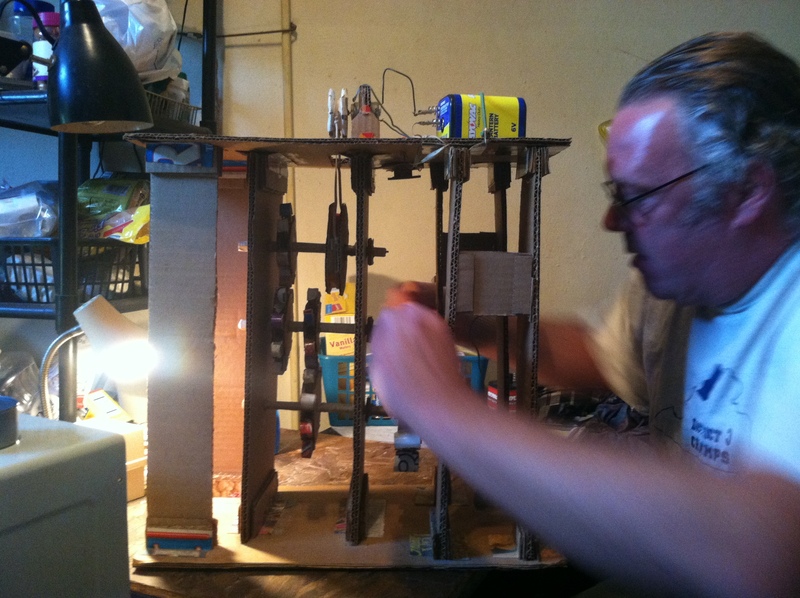 Doug Hill working on a battery-powered version of one of his clocks. 2. 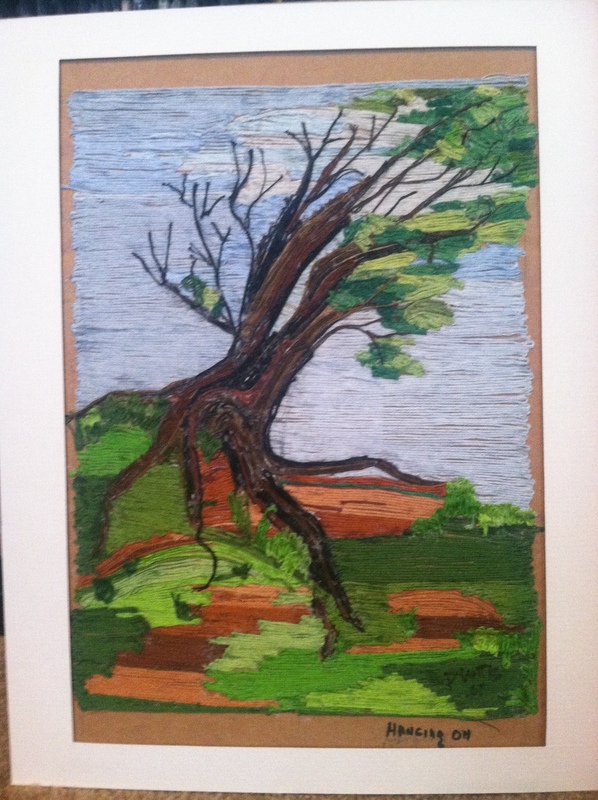 Dorothy Williams, Hanging On, embroidery floss on cardboard. 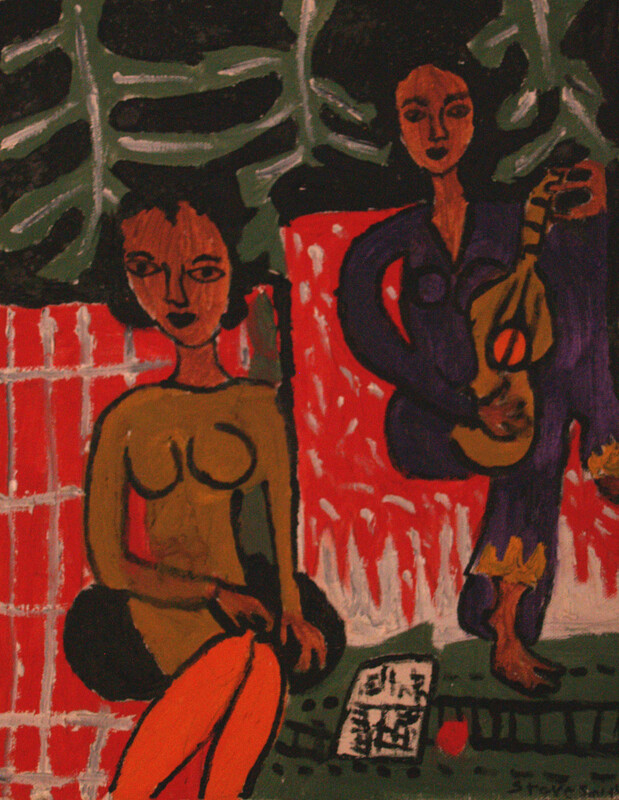 African American artist Dorothy Williams (1926 – 2005) created many scenes of her life memories. She grew up in the Hill District. In retirement she resided in East Liberty. Hanging On, embroidery floss on cardboard, Dorothy Williams. 3. Steve Smith, Rethinking a Dream, acrylic on canvas. Rethinking a Dream by Steve Smith. 4. Steve Smith, Wedding Spider, acrylic on canvas. 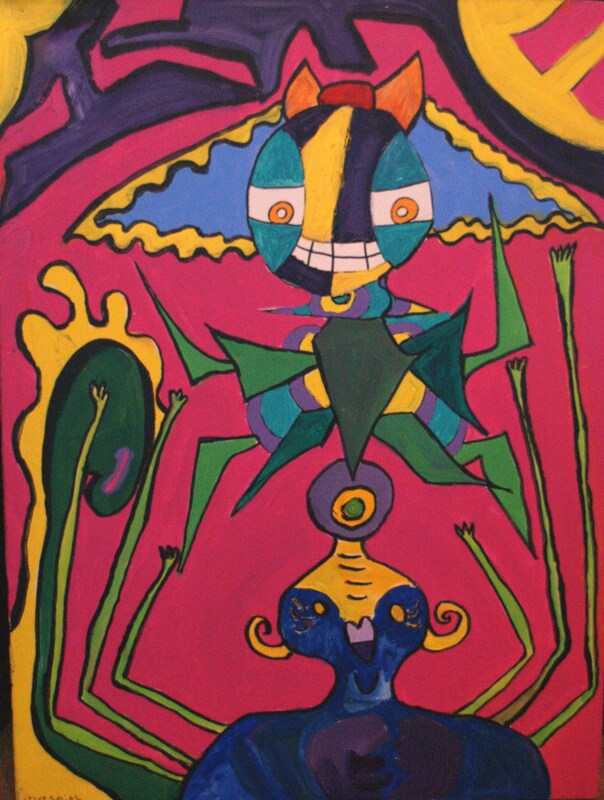 Wedding Spider, acrylic on canvas, Steve Smith. 5. Steve Smith, The Visions, mixed media on paper. The Visions, mixed media on paper by Steve Smith. 7. Dorothy Williams, My Walking Stick, embroidery floss on cardboard. 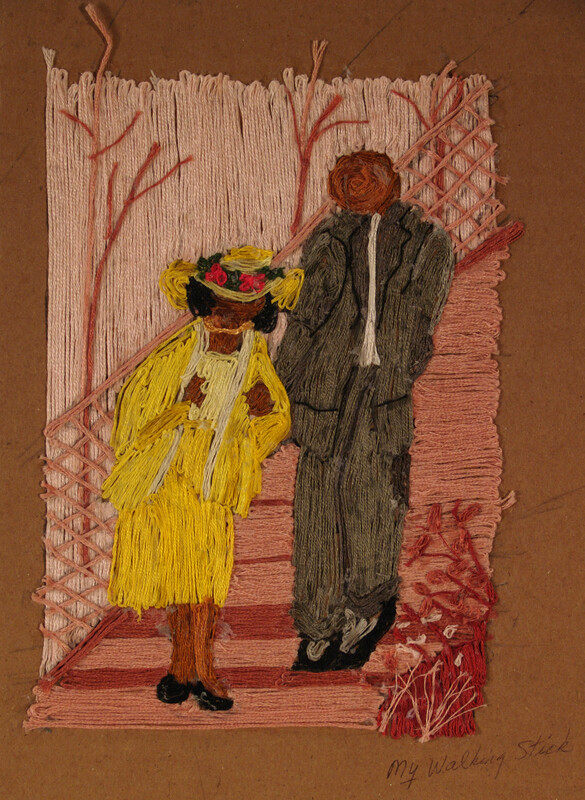 In this string painting, Ms. Williams depicts her son helping her to church. My Walking Stick, embroidery floss on cardboard, Dorothy Williams. 8. Dorothy Williams, Outrunning the Rain, embroidery floss on cardboard. 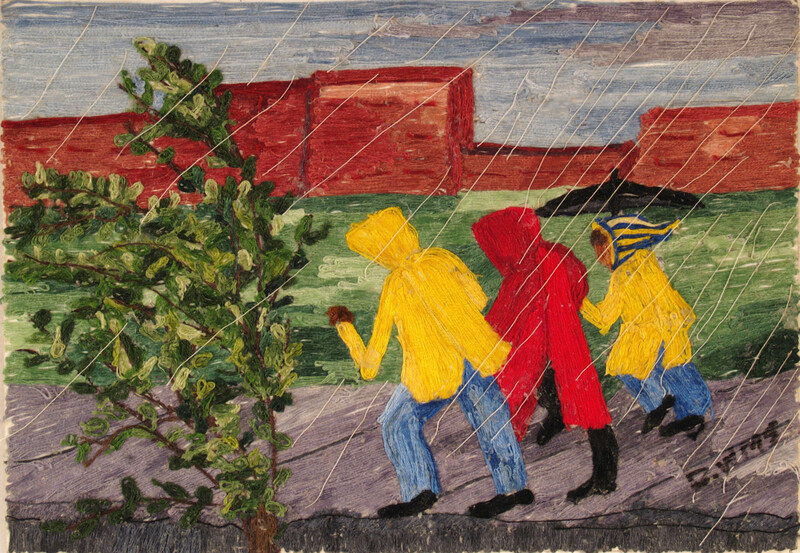 In this piece Ms. Williams depicts herself as a child running home from school in the rain with her classmates. Outrunning the Rain, embroidery floss on cardboard, Dorothy Williams. 9. 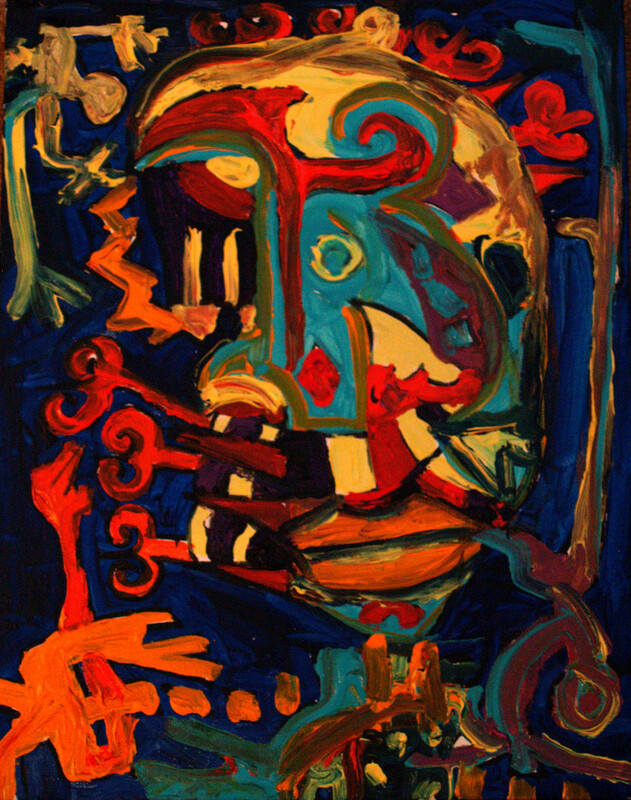 Steve Smith, Peace Pipe, mixed media on paper. 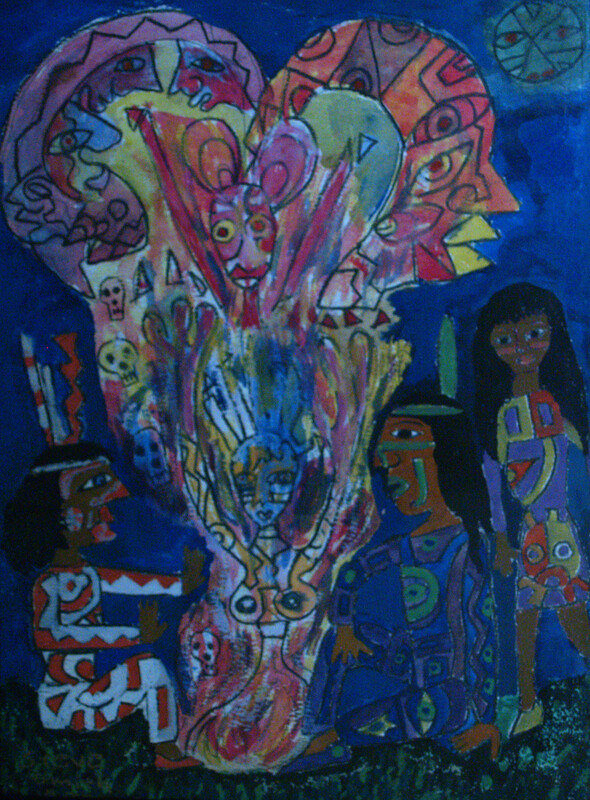 Peace Pipe by Steve Smith. 10. Doug Hill, six cardboard gadgets, cardboard, glue & string. 11. 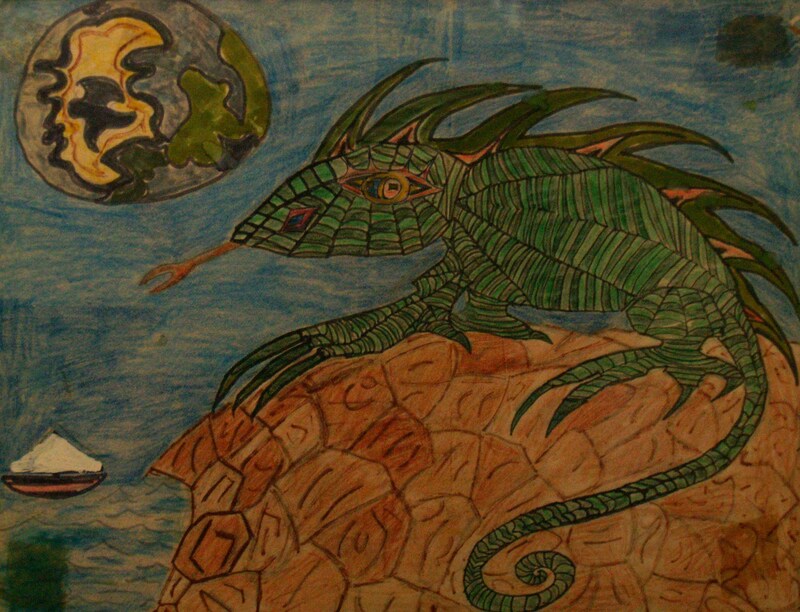 Steve Smith, Iguana World, mixed media on paper. In this piece, Smith recalls looking into the window of the pet store at Monroeville Mall. Iguana World by Steve Smith. 12. Steve Smith, Magic Hat, mixed media on paper. 13. Doug Hill, hand-stitched bag. Aside from making cardboard gears, Hill uses whatever he can find to design basic life tools. 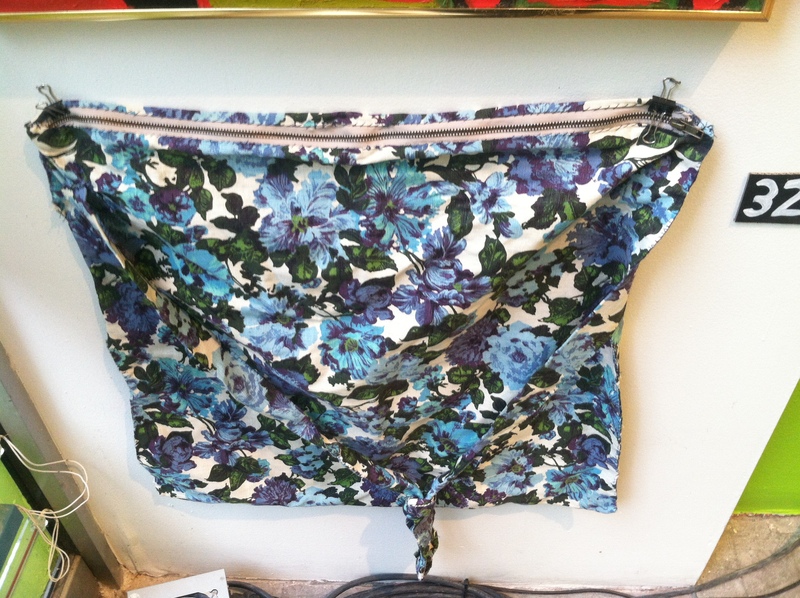 Here is one of the bags that he uses for shopping and toting his art supplies. Hill often makes his works at coffee shops and libraries. 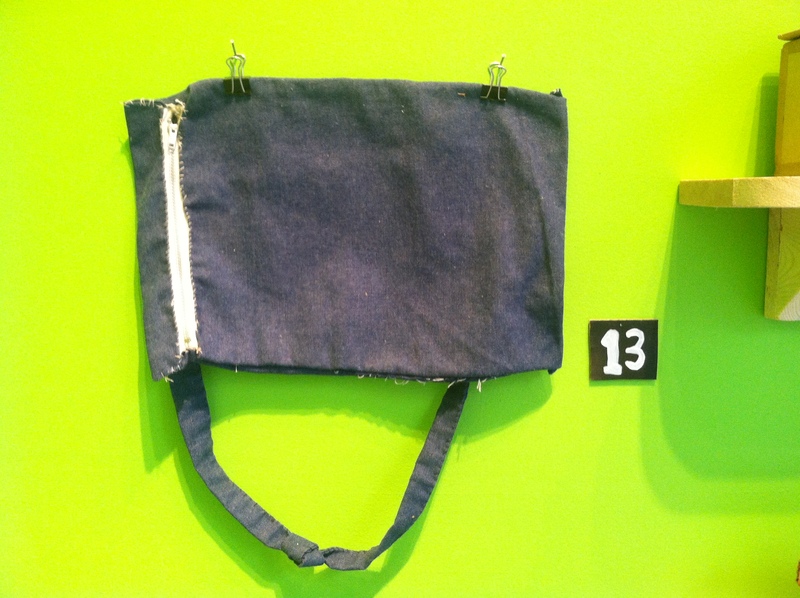 Hand-sewn bag by Doug Hill. 14. Doug Hill, Bus Door Mechanism, cardboard & glue. Hill looks at everyday objects for inspiration. For this piece, he studied the door mechanism for a city bus. 15. Steve Smith, My Precious Love, pastel on paper. My Precious Love by Steve Smith, pastel on paper. 16. Jim Rettinger, One Small Step, hand-built ceramic form & found objects. 17. 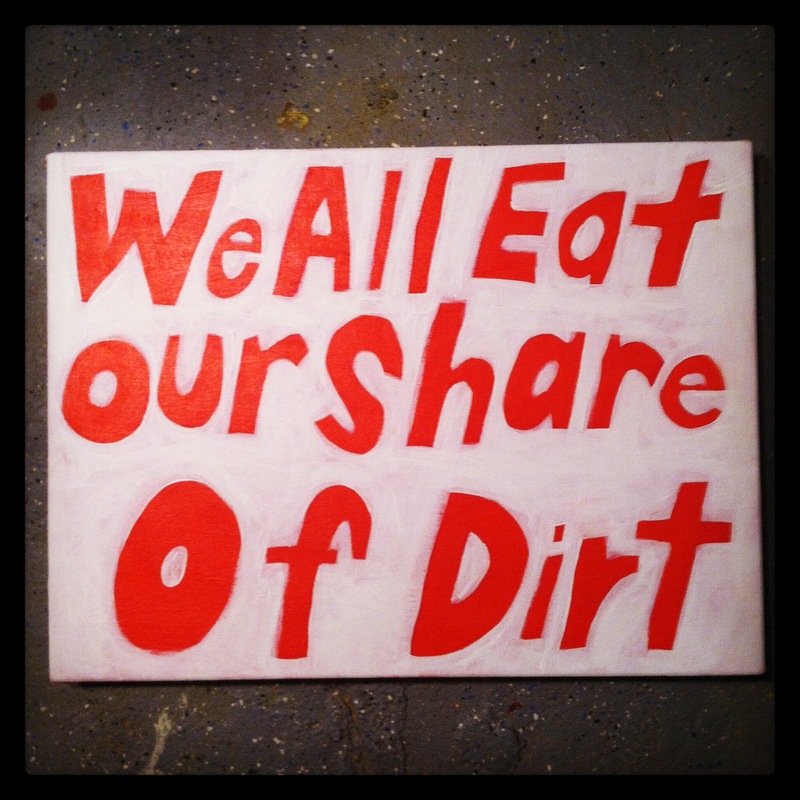 Tom Sarver, We All Eat Our Share of Dirt, acrylic on canvas. We All Eat Our Share of Dirt, Tom Sarver, acrylic on canvas. 18. 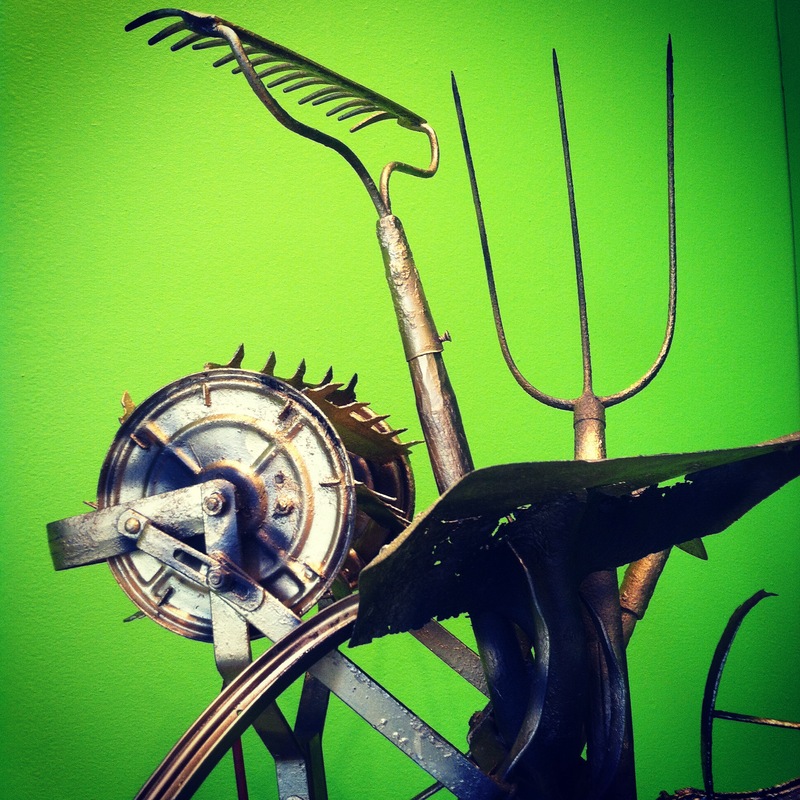 Jim Rettinger, Cultivation, found objects, hardware, spray paint. Detail of sculpture by Jim Rettinger. 19. Steve Smith, Insulted, acrylic on canvas. Insulted, acrylic on canvas , Steve Smith. 20. Tom Sarver, Hook, acrylic on wood. 21. Steve Smith, Inner Man, acrylic on canvas. 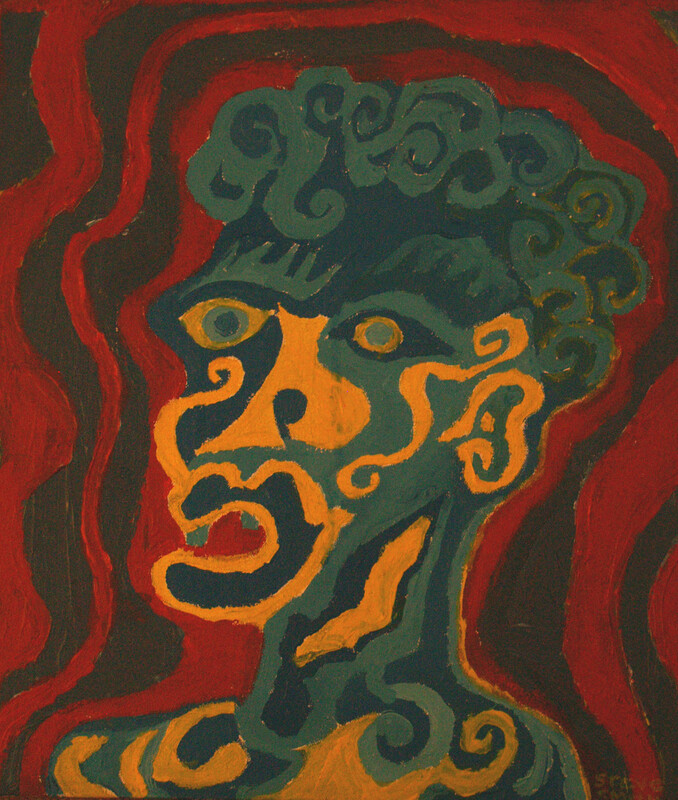 Inner Man, by Steve Smith, acrylic on canvas. 22. Doug Hill, seven cardboard gadgets. 23. Doug Hill, Elevator, cardboard, string and glue. 24. Steve Smith, The Recital (after Matisse), acrylic on canvas. The Recital (after Matisse) by Steve Smith. 25. Steve Smith, Kitty Storm, acrylic on canvas. 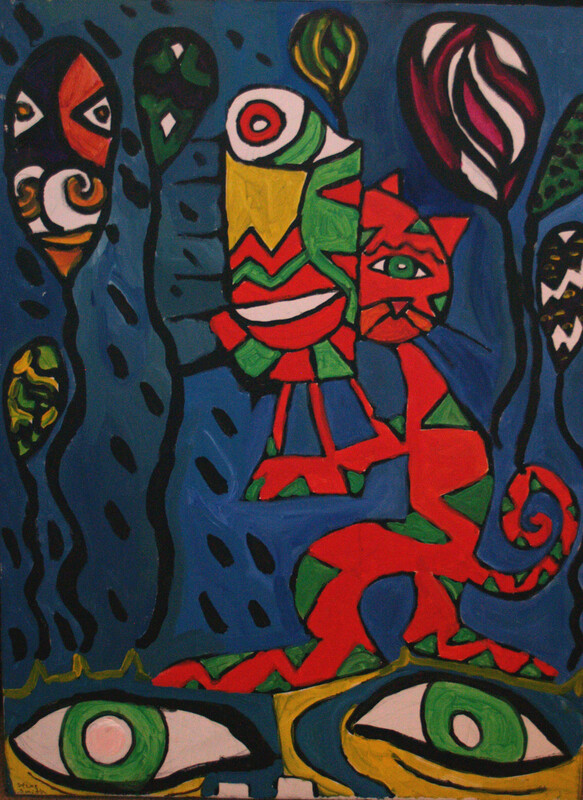 Kitty Storm, acrylic on canvas, Steve Smith. 26. Dorothy Williams, Fishing Hole, embroidery floss on cardboard. 27. Doug Hill, Robotic Hand, cardboard, string, glue & stick. Doug Hill demonstrates his Robotic Hand. 28. 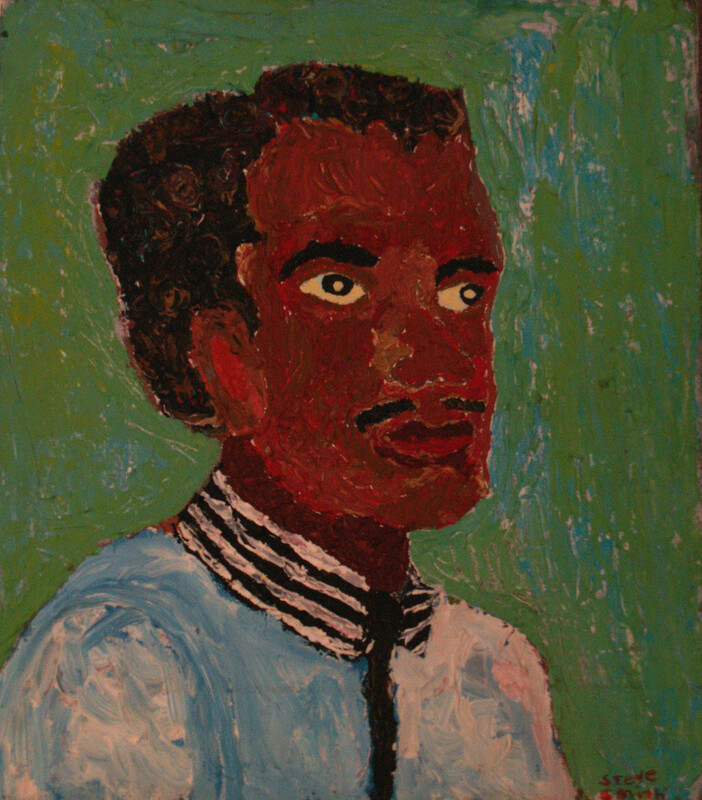 Steve Smith, Self Portrait as a Young Man, acrylic on canvas. 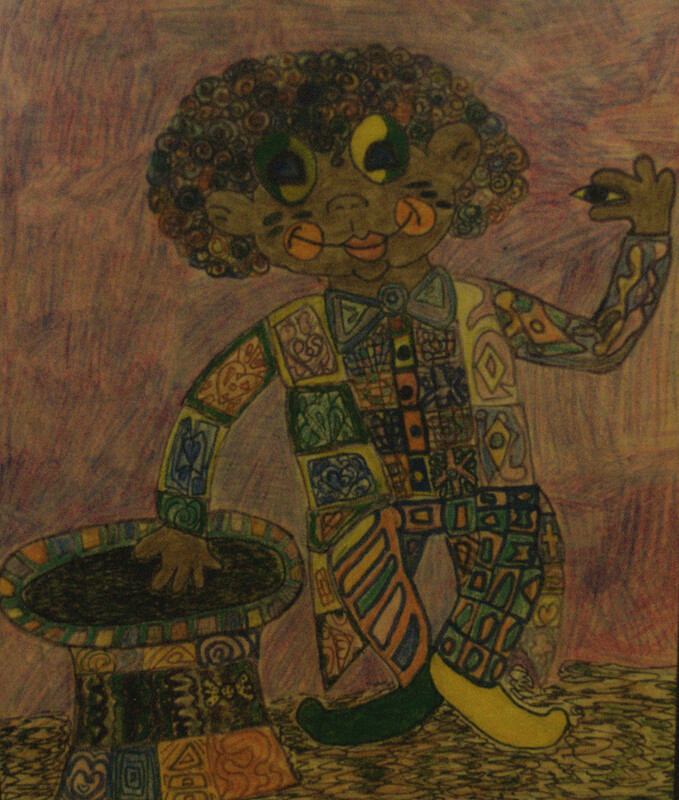 An early self-portrait by Steve Smith. 29. 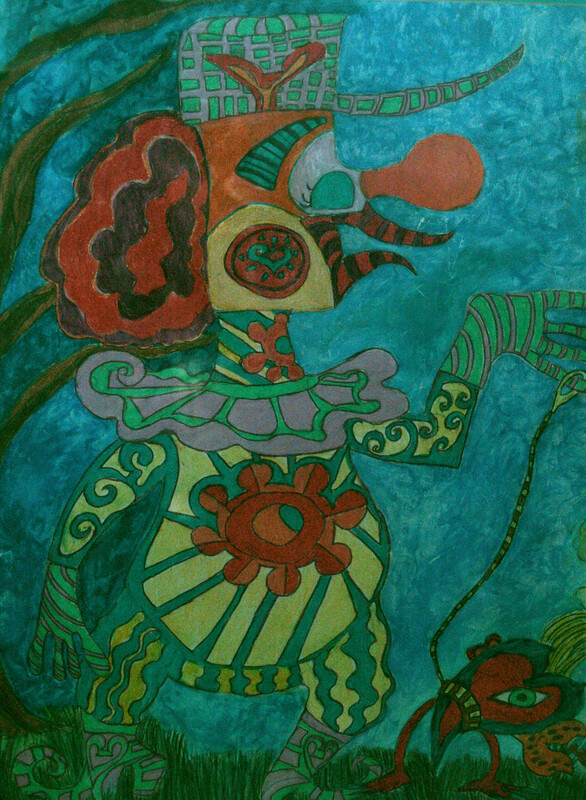 Steve Smith, Clown Walking a Heart Dog, mixed media on paper. Clown Walking a Heart Dog, an early pastel work by Steve Smith. 30. Joann Kielar, Puppet Collection: Pig and Cat, The Little Red Hen, Rapunzel, Rapunzel’s Witch, The Tiger, found materials, fabrics and paint. 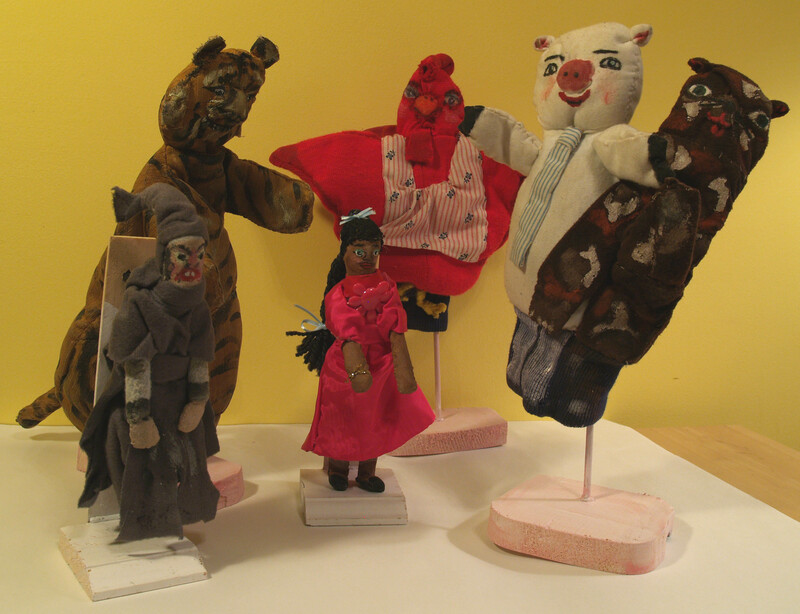 Handcrafted puppets made by and used in performances by Joann Kielar. 31. 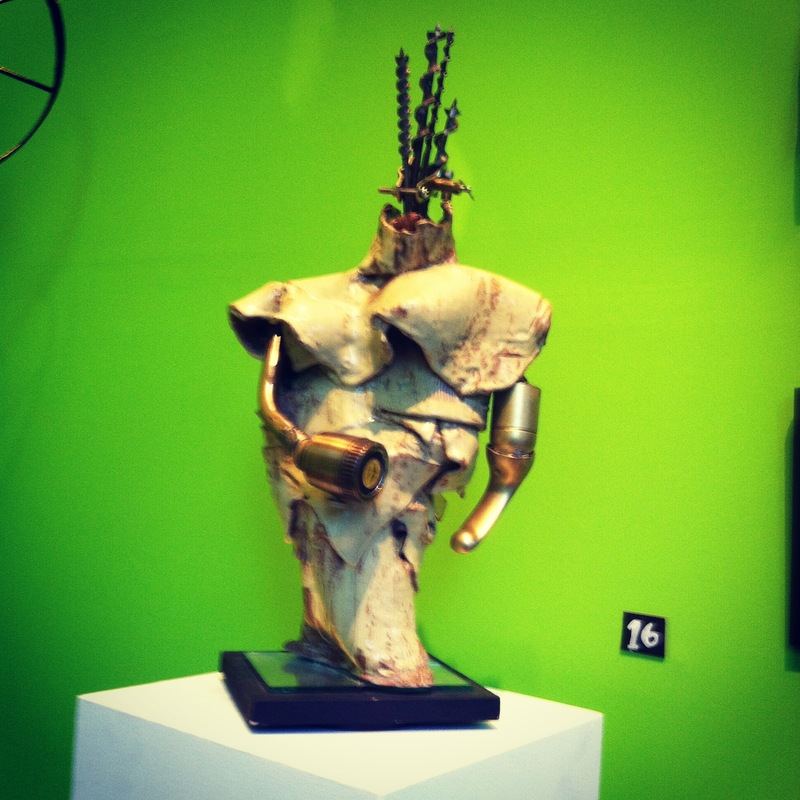 Jim Rettinger, Angel of the Hot Mill, hand-built ceramic form, found objects. Angel of the Hot Mill, by Jim Rettinger. 32. Doug Hill, hand-stitched bag. 33. Steve Smith, Garden Girl, acrylic on canvas. Pittsburgh visionary artist Steve Smith with his painting, Garden Girl. 34. Liz Hammond, Simple Cells (fiber arts hanging sculptures). “Even though each cell’s pattern possesses a multitude of possibilities of what could be its final formation, and despite that each cell emerges from the same process, every cell’s final structure is singular. It is an exercise in individuality, symmetry and gravitational balance; a study of positive versus negative space and what can be discovered in-between. Just like one can see images in inkblots, the observer can similarly explore the nature of these Simple Cells and enable their subconscious thoughts to materialize.” – Liz Hammond. 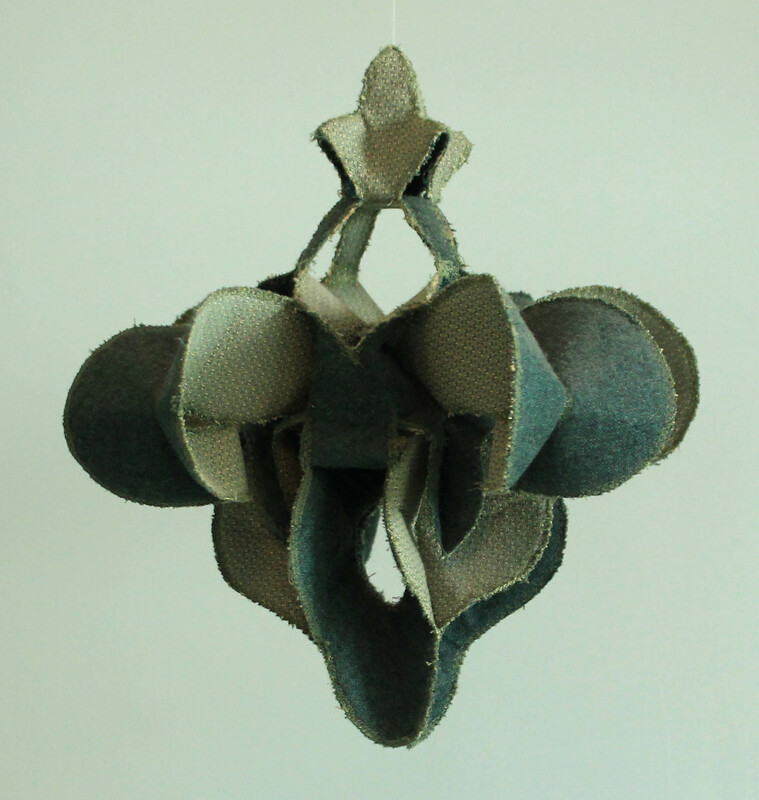 A Simple Cell fibers sculpture by Liz Hammond. Five Simple Cells are on view suspended in the gallery space. 35. 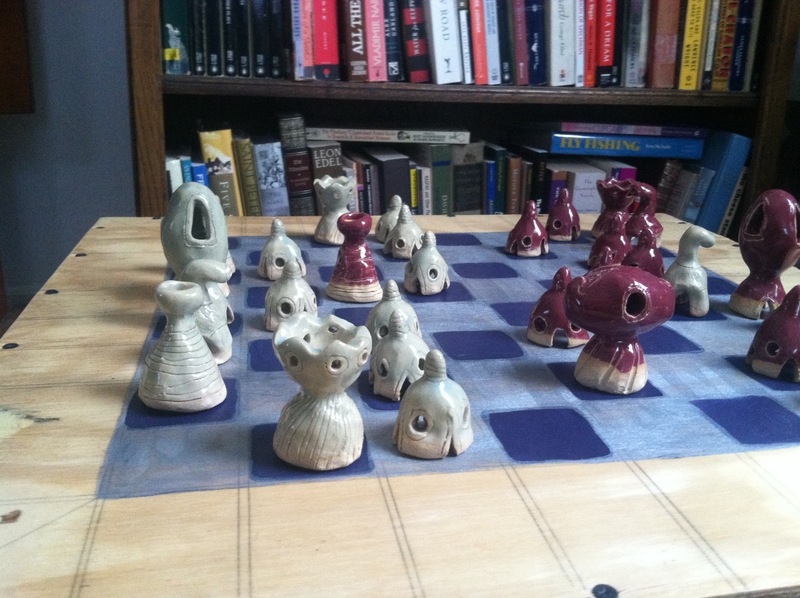 Tom Sarver, chess set, hand-built, glazed ceramic pieces, wooden board. Chess Set, glazed ceramic pieces, wooden board. Interdisciplinary artist Liz Hammond has been active in music, performance art, sculpture, and theater. In the 1990s she was a member of the Industrial Arts Co-op, the team of salvage artists that created the monumental Carrie Deer sculpture at the abandoned Carrie Furnace industrial site in Rankin, Pennsylvania. Recently, Hammond has been creating a collection of soft sculpture fiber work she calls Simple Cells. These abstract works, exploring form and materials, suggest ideas for larger structures. 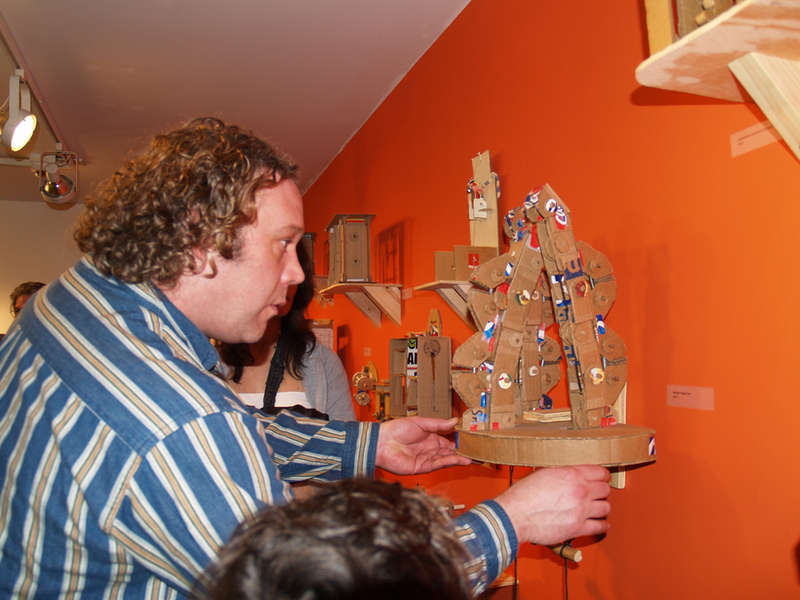 East Pittsburgh artist Doug Hill creates simple machines out of cardboard. Hill’s inspiration for these sculptures comes from the gadgets of everyday life. He closely observes everything from bus doors to clocks and Venetian blinds. 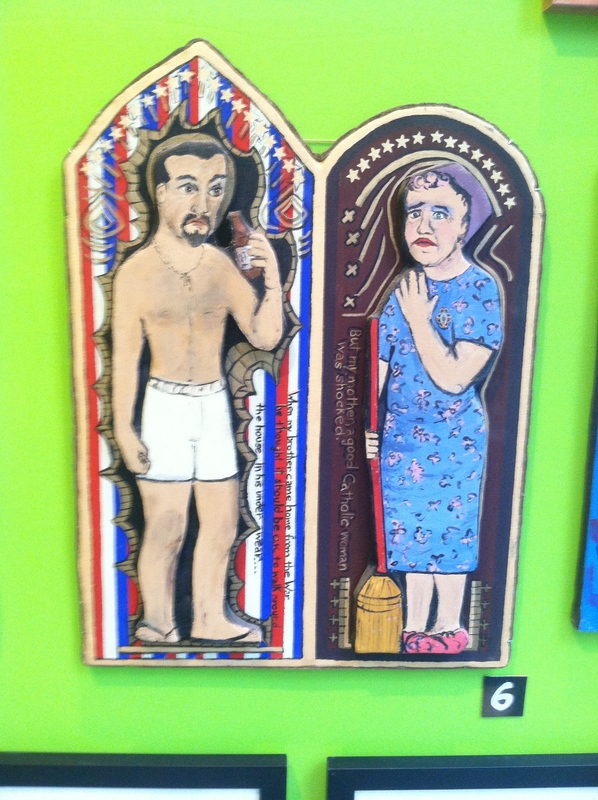 Hill’s work was featured in an exhibition at Pittsburgh Center for the Arts in 2008. His work has also been shown at The Brew House and The Irma Freeman Center for Imagination. Joann Kielar is a Pittsburgh artist, puppeteer, and storyteller. As an educator, she promotes the art of puppetry with projects in schools and at community events. In her work she explores the interaction of words and images. Her handcrafted glove puppets, rod puppets, and doll-like characters are designed in visual accompaniment to the stories that she writes. Jim Rettinger has been active in the arts in Western Pennsylvania for many years, and he was a public school art teacher for 38 years. 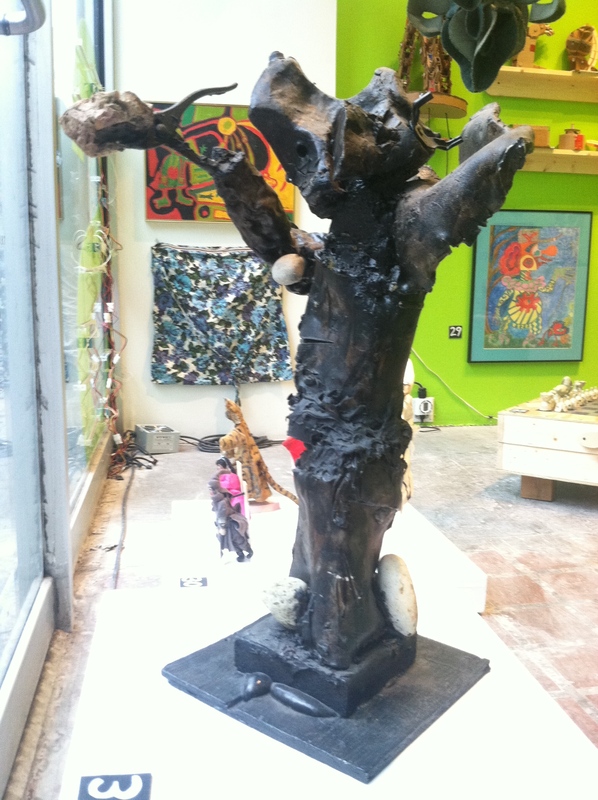 His sculptural assemblages fuse decaying wood, obscure antique objects, and hand-formed clay. 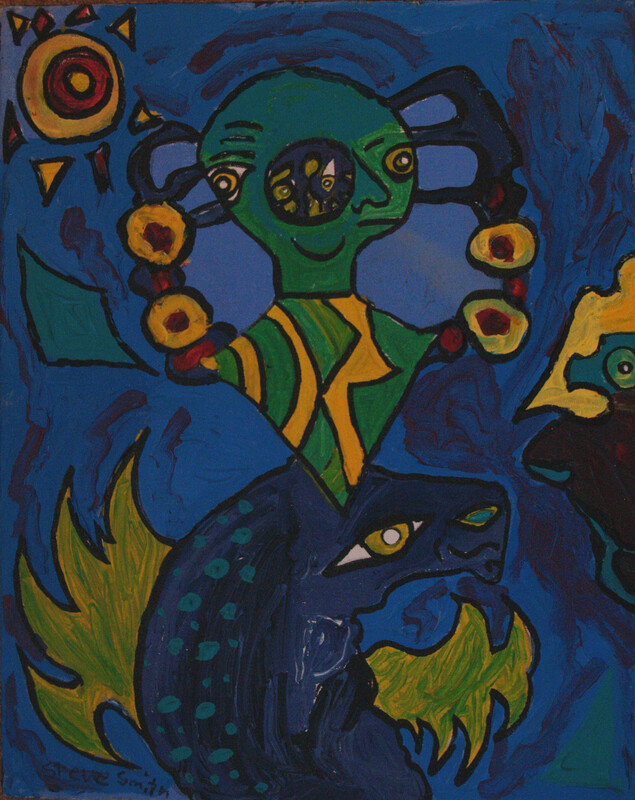 The resulting creations are expressive creatures, symbolic constructions, and surrealist visions. In one of his works, Rettinger comments on the passage of time by stacking and gluing together many clock radios, all plugged in with flashing displays. Tom Sarver is a Pittsburgh puppeteer, artist, and curator. His projects with Pittsburgh visionary artists include curating a 2008 exhibition at Pittsburgh Center for the Arts, titled Binding Forces, and a 2004 show at The Brew House, titled From the Inside. 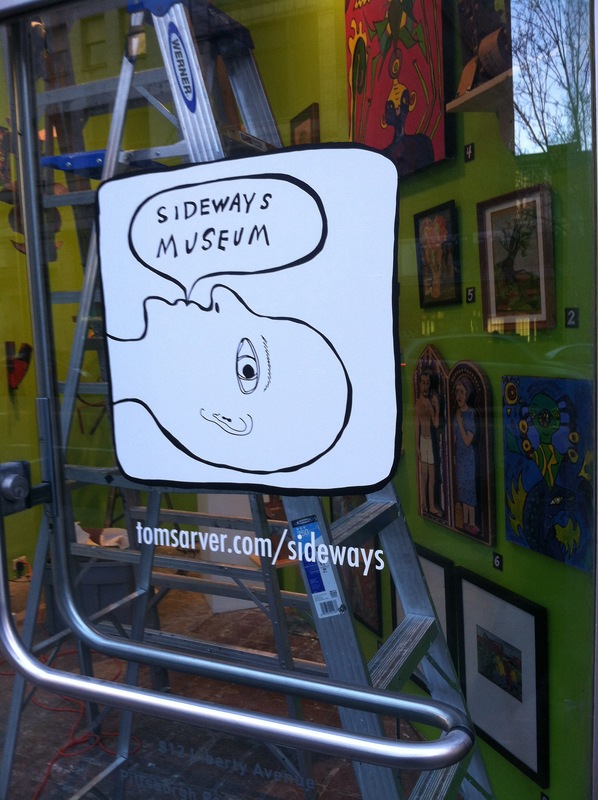 From September 2006 through May 2008, Sarver included work by local self-taught and professional artists in his live-in project at the Mattress Factory, The Tom Museum. Steve Smith’s paintings are inspired by personal experience, world events, and news broadcasts. 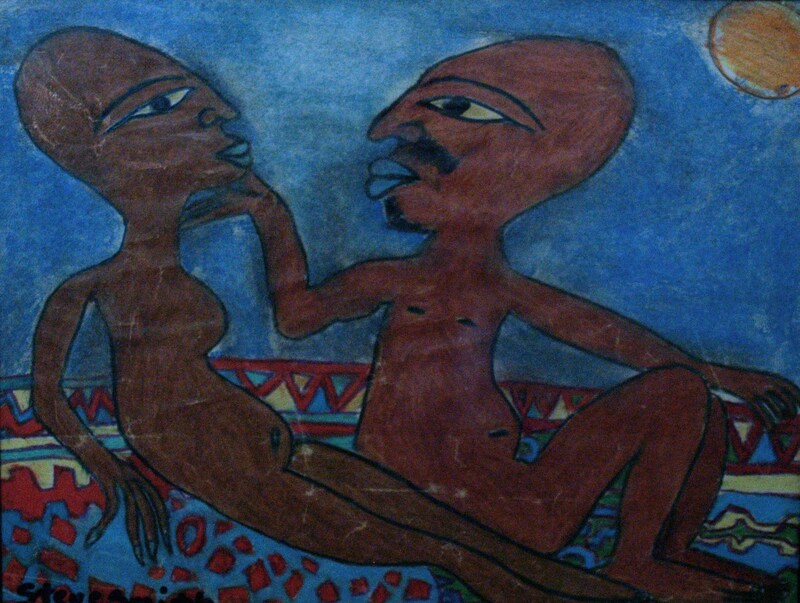 His style is influenced by ancient and primitive cultures. As a teenage art student in Braddock, Pennsylvania, Smith was fascinated by the early cultures of Egypt, Africa, and the Americas. Although health issues challenged his career dreams, Smith pushed ahead and continued to make art. Today, Smith has a collection of drawings, sketches, and paintings that document the events of his lifetime. 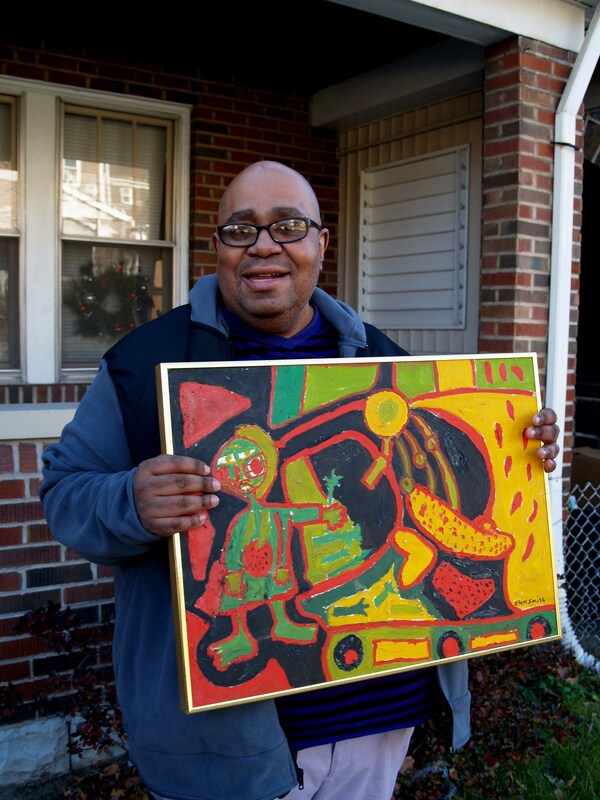 His bold, patterned works have been shown in Pittsburgh hospitals, shops, and neighborhood art galleries. Dorothy Williams (1926–2005), from the Hill District and later East Liberty, had a professional career as counselor for women in prison. Later in life, she began creating images made by gluing colored embroidery floss, one string at a time, to pieces of cardboard. The works document rich memories of her African-American heritage, and they also reveal themes of racial equality and integration. Her many string painting images include an integrated dance party, a fishing outing, and running home from school in the rain. Her work has been exhibited in shows at Top Notch Art Centre, The Tom Museum, The Brew House, and Pittsburgh Center for The Arts.